Time capsules… messages from today to the world of tomorrow! Everything from perishable beer & cigarettes to an entire car have been sealed in vaults for 25, 50, 100 years or much longer. Time capsules may not be time travel but they’re the nearest thing to it we’ve got. Here are 10 of the trippiest. This somewhat gloomy time capsule can be found in the Old City Cemetery of Sacramento, California. In an oddly humorous touch, the city’s Old City Cemetery Commission (O.C.C.C.) 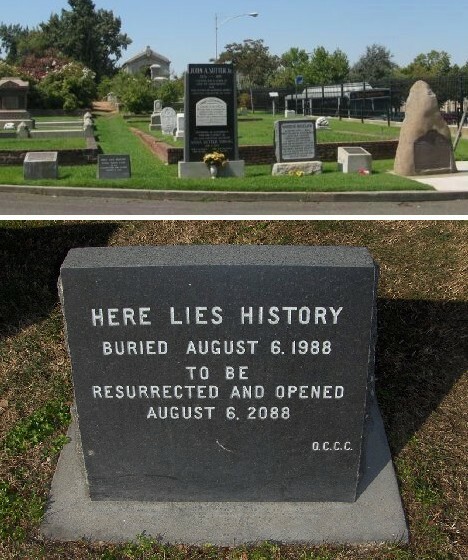 had the 1988 marker engraved “Here Lies History”. What kind of history? We’ll have to wait another 78 years to find out. 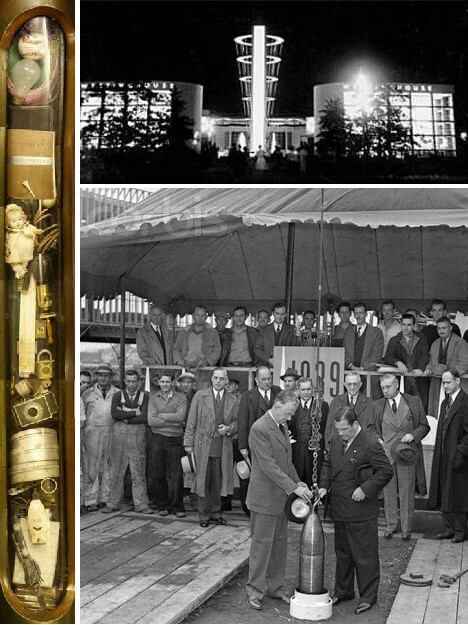 At the bottom of a shaft sunk 50 feet beneath Flushing Meadows Park, smack dab between the Hall of Electrical Power and The Hall of Electrical Living of the Westinghouse Pavilion, is a 90-inch long, sealed time capsule. 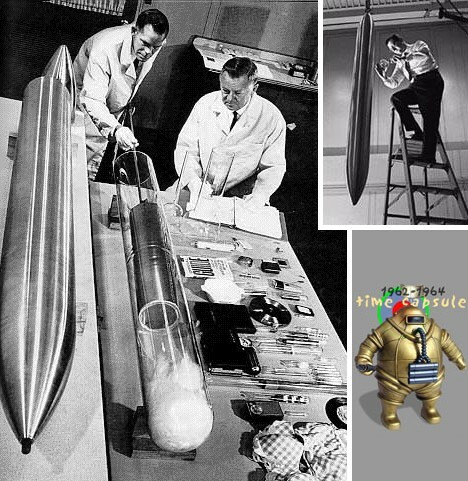 The capsule weighed 800 pounds and featured an outer casing made from Cupaloy, an alloy consisting of 99.4% copper, 0.5% chromium and 0.1% silver. 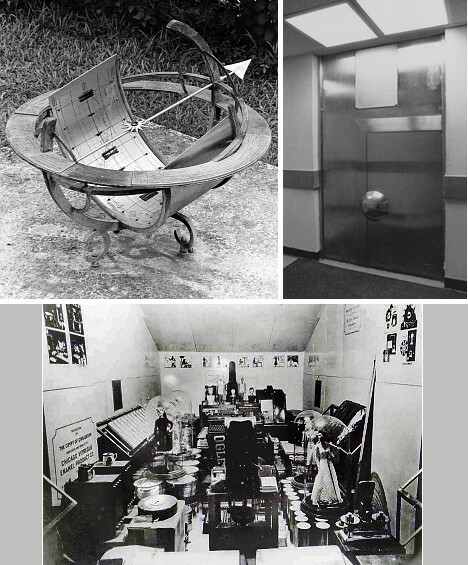 Designed to last 5,000 years, the capsule was interred on September 23, 1938 with the expectation that it will not be opened again until the year 6939. 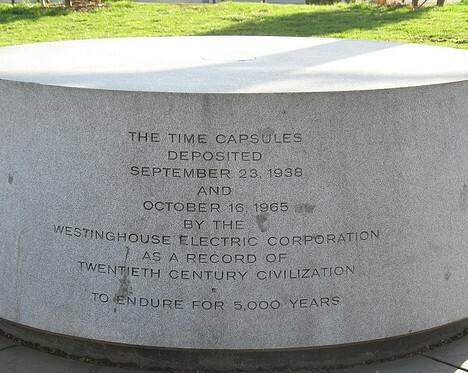 Westinghouse built another time capsule – this time made of Kromarc stainless steel – for the 1964 New York World’s Fair and today it lies buried within a few feet of the 1938 capsule. In contrast to the earlier version which was buried before the fair opened, the later capsule was displayed at the fair, suspended between a trio of pylons. It wasn’t interred until October 16, 1965 and is to be opened along with its older sibling 5,000 years hence. Can’t wait! 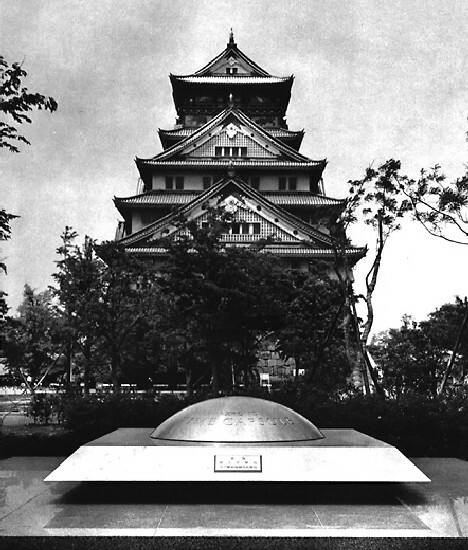 The 1970 Osaka World’s Fair celebrated “Progress and Harmony for Mankind” and serves as a convenient starting point for Japan’s incredible 20-year economic boom. 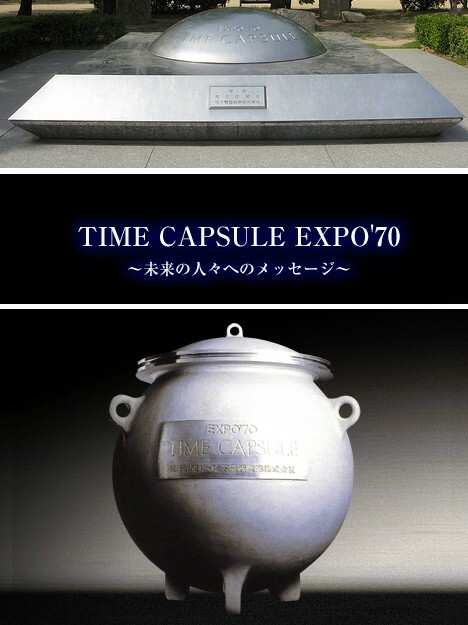 A time capsule inspired by the Westinghouse capsules from the 1939 and 1964 New York World’s Fairs was a popular draw at the Osaka fair. 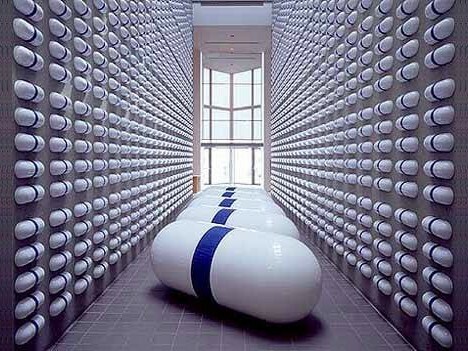 Designed and sponsored by Panasonic and the Mainichi newspaper group, the capsule was designed in 2 parts: an upper portion to be opened in the year 2000 and every 100 years thereafter and a lower casing which was to be sealed until the year 6970. Each portion contains 2,098 objects and recordings specifically chosen to reflect and represent the forward-looking, pre-disco world of 1970 AD. 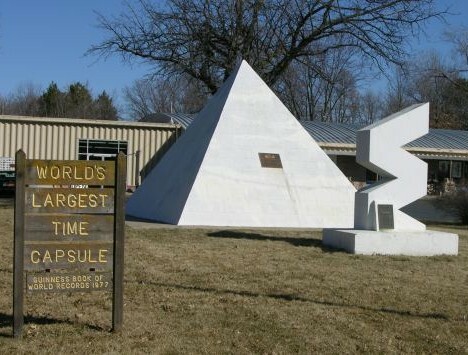 Where would one go to find the official, GWBR-certified “World’s Largest Time Capsule”? Not in the center of a major metropolis or at a global exhibition attended by millions, but instead at 318 Hillcrest Dr., Seward, Nebraska. At that exact location sits a brilliant white pyramid below which is a 20′ by 8′ by 6′ concrete vault housing a variety of typical – actually, stereotypical – Seventies memorabilia including a new 1975 Chevy Vega and a leisure suit. The builder of the Seward Time Capsule, Harold Davisson, added the pyramid in 1983. By then, funding was of greater concern and instead of a new car Davisson entombed a used ’75 Datsun. 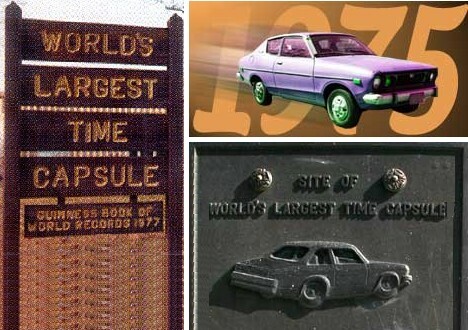 Davisson passed away in 1999 and his original time capsule is scheduled to be opened on July 4, 2025: not near enough time for the Datsun to start appreciating in value. 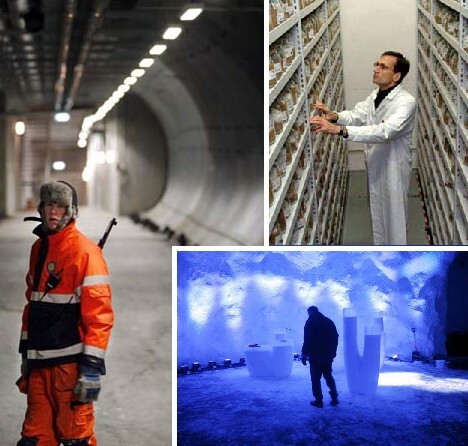 It may not be a time capsule in the truest sense, but the Svalbard Global Seed Vault may prove to be more memorable than every other time capsule combined. 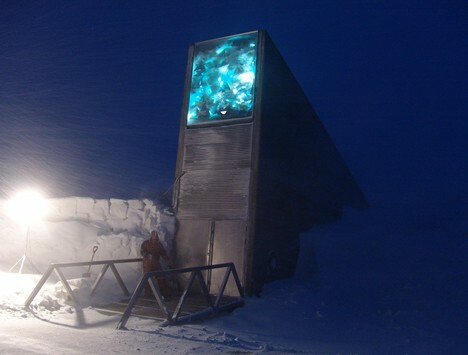 Built into a mountain on the far northern Norwegian island of Svalbard, the so-called “Doomsday Vault” is actually a gene bank charged with keeping the world’s essential botanical biodiversity on ice, in seed form. Armed guards are on patrol to ensure any evildoers are put on ice as well. 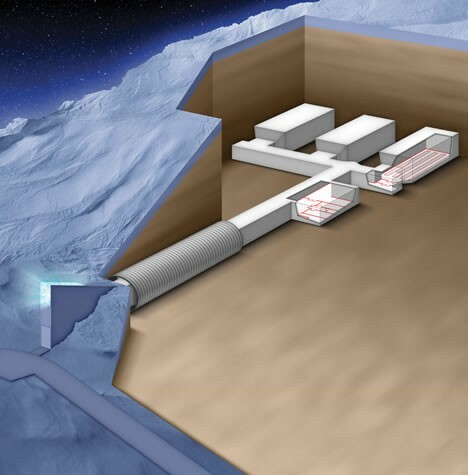 The vault complex has a capacity of over 2 billion seeds, and its chambers are cooled to a temperature of -18° Celsius (-0.4° Fahrenheit) using a 10-kilowatt compressor powered by electricity generated locally. Seeds stored at the Svalbard Global Seed Vault remain viable for hundreds, even thousands of years – in the case of barley seeds, up to 20,000 years. Great news for future brewmeisters! 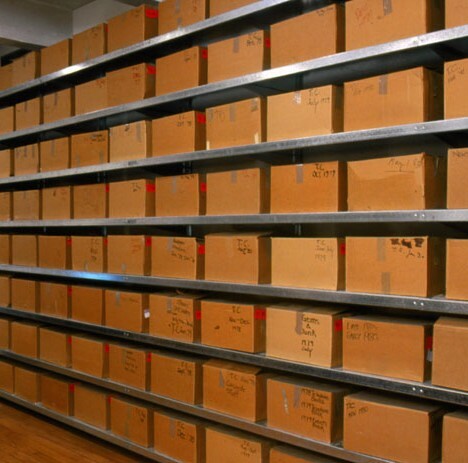 The acclaimed pop-artist Andy Warhol once wrote, “What you should do is get a box for a month, and drop everything in it and at the end of the month lock it up.” Beginning in 1974 Warhol did just that and more. 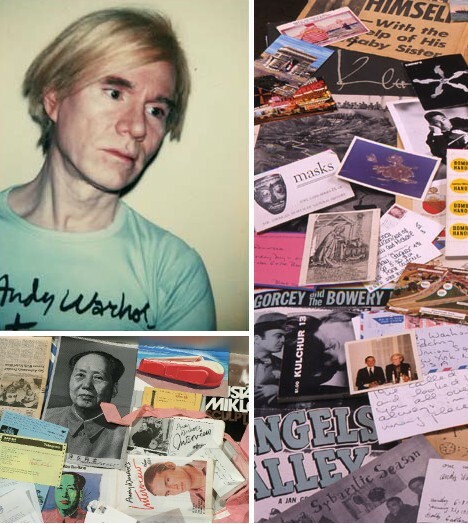 By the time of his death in 1987 the pale eccentric had filled and locked away 612 individually boxed time capsules that are today stored at the Andy Warhol Museum in Pittsburgh, PA.
Concert ticket stubs, magazine pages, articles of clothing and much more can be found in these tiny treasure chests but what makes them extra special is the Warhol mystique and his connections to the pop culture of his era. A Christmas card signed by Paul & Linda McCartney. Clark Gable’s shoes. A signed photo of Shirley Temple. If one is going to make a time capsule, it helps to be deeply in tune with the times. 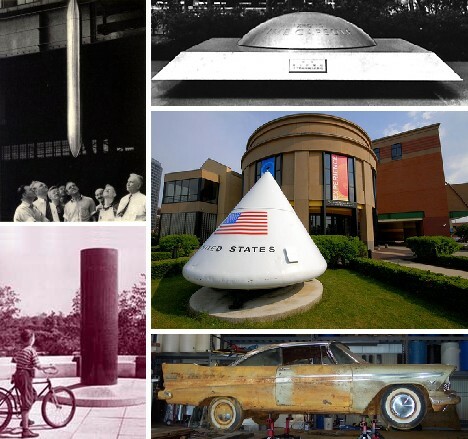 When is a time capsule a space capsule? When it’s BP-1227, an official NASA boilerplate Apollo Command Module mockup. 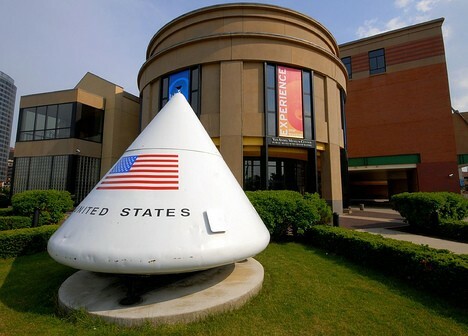 Today the module serves as a time capsule in Grand Rapids, MI, due to be opened on the American Tricentennial in 2076. That would be cool enough in and of itself, but BP-1227 has the dubious distinction of being the only American space capsule recovered by the Soviet Union after splashdown. 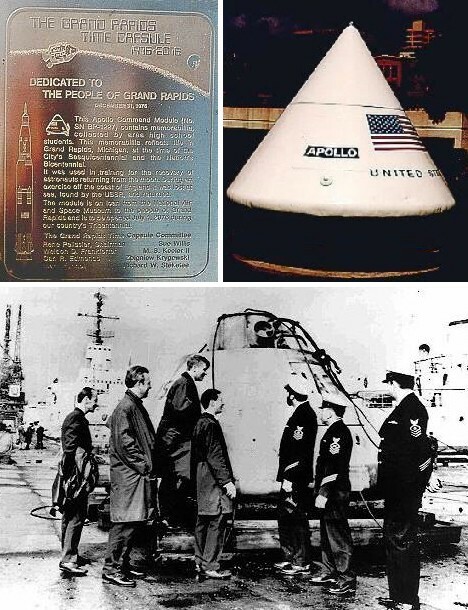 BP-1227 was lost at sea early in 1970 as it was being used to train UK-based naval units in spacecraft recovery. Well, not exactly “lost”… a Soviet fishing trawler (or what looked to be one) lurking in the area first snagged the capsule from under American noses, then spirited it away to the communist motherland for a detailed KGB analysis. Later that year and in a climate of detente, the American Coast Guard icebreaker Southwind made an official courtesy call at the arctic port of Murmansk. To the rather large surprise of the ship’s crewman, the Red Navy dropped off a rather large surprise package: BP-1227! 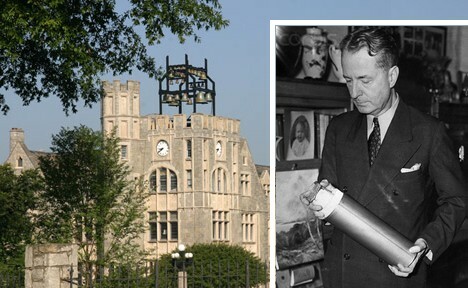 The grandiosely named Crypt of Civilization is a huge, 2,000 square foot chamber set into the foundation of Phoebe Hearst Memorial Hall at Oglethorpe University. The massive vault rests upon Appalachian granite bedrock to ensure stability in case of a major earthquake – not exactly common in the state of Georgia but who knows what can happen over the course of 6,000-odd years! Yes indeed, the Crypt (which was converted from an indoor swimming pool) was sealed in 1940 with instructions it not be opened again until the far-off future year 8113! 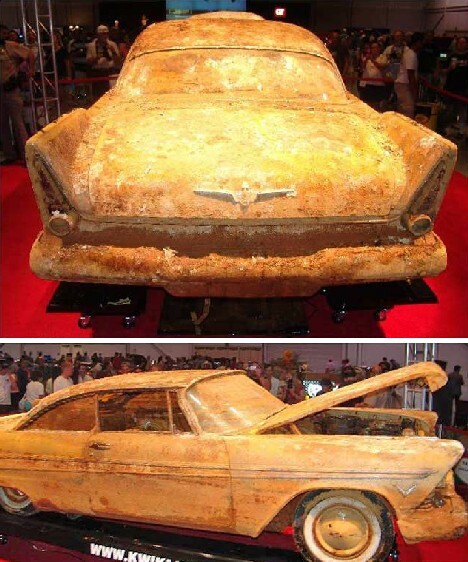 The 1957 Tulsarama was highlighted by the entombment of an unusually large time capsule: a 1957 Plymouth Belvedere Coupe! 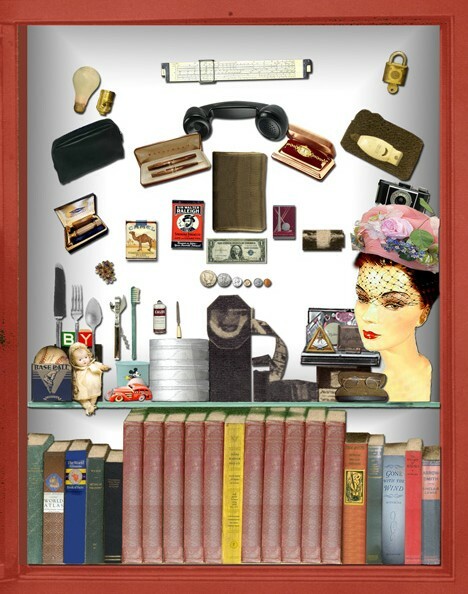 The car, with keys in the ignition, was loaded up with such Fabulous Fifties items as a six-pack of beer, 10 gallons of gasoline and 5 quarts of oil (assumedly nonexistent in 2007) and the contents of a woman’s purse. The car was sprayed with Cosmoline preservative, wrapped in a clear plastic baggie and gently lowered into a concrete vault sunk deep into the city courthouse lawn. Unfortunately, time waits for no man and as soon as the vault was sealed, deterioration set in. At some point in the past half century groundwater began to leak into the crypt and by the time the lid was pried off in the summer of 2007, it had risen to a height of 4 feet! It remains to be seen if the heavily oxidized Plymouth can be restored – what’s known for certain is that the six-pack of beer didn’t make it. May it rust in peace. Thinking of building a time capsule and want to do it up right? 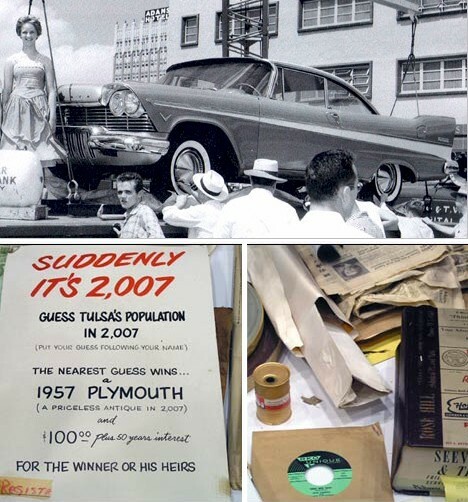 No problem – there are even companies in the time capsule business who can help. With forethought and preparation, your primitive artifacts (maybe an iPhone, an Energizer battery, a cheeseburger and an Obama button) could survive the centuries… and provide much bemused wonder to the Planet Express gang in the year 3000.